1959; 313 pages. Genre : Post-apocalyptic fiction. Awards : Hugo (1961). Overall Rating : B. A Canticle For Liebowitz chronicles a monastery in the futuristic American Southwest, and is divided into three parts : Fiat Homo ("Let There Be Man"); Fiat Lux ("Let There Be Light"), and Fiat Voluntas Tua ("Thy Will Be Done"). The first part takes place in the 25th century, as mankind struggles to survive in the aftermath of a devastating 20th-century nuclear holocaust. There are mutants, wolves and brigands, and a potent anti-knowledge movement which executes all intellectuals and burns all books. The second part takes place 600 years after the first (3174 AD); when technology is being re-learned, for better and for worse. The third part takes place 600 years after that, (3781 AD) when galaxy-travel has been perfected, and when a nuclear holocaust again is a distinct possibility. The emphasis is on historical reflection here, not on thrills-&-spills action. Miller explores the "history repeats itself" motif : Holocaust, Dark Ages, Renaissance, Holocaust, Dark Ages, Renaissance, and so on. He also looks at the inherent conflict between Scientific Knowledge and Church Dogma, and the respective roles of Church and State on issues such as Euthansia. And he focuses on the contributions (past and future) of manasticism to civilization - copying books and preserving knowledge when no one else is/was there to do it. There are a number of interesting characters. Brother Francis, who stumbles upon pre-holocaust relics. The wanderer who manages to show up in all three books. And the Poet, who's a man after my own heart : quick of wit, and short of common sense. Oh yeah - and there's "booklegging". The art of locating, smuggling, copying, and preserving books, for the sake of Knowledge, even at the cost of one's life. Hey, everyone at 5-Squared should aspire to this noble criminal activity, should worse come to worst. The characters may be interesting, but except for the Wanderer, they all die off within 100 pages/600 years. So don't get too attached to anybody. There's an abundance of Roman Catholic-sounding Latin throughout the book. I hate Latin. If you saw my grades in it from Junior High, you'd understand why. Those who don't learn from History are condemned to repeat it. 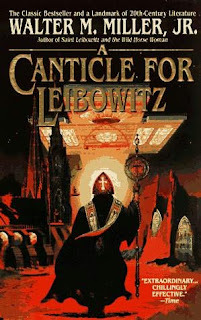 A Canticle For Liebowitz received mixed reviews when it came out. Some loved it (hence the Hugo); some hated it, including the Catholic Digest. Miller joined the Catholic Church in 1947 (prior to that he called himself an atheist), and there is an aura of Catholicism througout aCfL. The Catholic Church didn't like aCfL, because there are a lot of theologic foibles here. For example, "Saint Liebowitz" was in fact a Jewish engineer. And some of his "relics" revered in the monastery, are things like a shopping list ("pound pastrami; six bagels") and a cover page for an intra-office memo. Then there's the canonization of Saint Liebowitz, due to ailing penitents who swear they prayed to him, and were healed. This novel took a huge toll on Miller. Prior to this, he was a prolific short-story writer. Indeed, aCfL is actually three of his short stories, re-worked and synchronized into a coherent novel. Alas, after this, he suffered from depression and writer's block; and he never had anything else published during his lifetime. He devoted himself to writing a sequel (technically a "midquel") to aCfL. In 1996 (that's 37 years later), when the midquel was just about done, he put a gun to his head and pulled the trigger. A Miller-appointed author-successor, Terry Bisson, put the finishing touches on the midquel. In closing, this is a great book for when you want to reflect upon history, mankind, and "the big cosmological picture". However it's not a good choice if you're in the mood for the clichéd Starship Troopers action-hero-against-the-monsters sci-fi tale. Read it to muse, not to be amused. Sounds interesting to me. I think I'd enjoy it, following the stereotype or not. Just so you know, I am involved in a project to read all the books that won a Hugo or Nebula award, but I haven't gotten to the older ones yet. A few years from now, I may be reviewing this. I liked that clever last sentence! Yeah, Miller's relationship to the church is a bit odd - he obviously has respect for the church as an institution, but as a theological organization, he doesn't seem actually believe, per se, in it at all. Strange, usually people profess just the opposite when they talk about religion. Oh man, 5-squared goes on vacation for week and then BAM suddenly 4 reviews in a night! I haven't decided whether or not I should read this one. It sounds interesting, and everyone has been recommending it to me for years, but I'm worried that it's going to be steeped in the sort of old catholic historical fiction writing, which I absolutely abhore. I just don't like that style. And since I'm working on an extremely difficult book at the moment, it might be awhile before I get to this book if I do decide to read it, possibly years. The style is odd... but it's not exactly like reading St. Augustine, or anything. On the one hand, it isn't written like a sci-fi novel, at least, I don't think so. Many sci-fi novels feel like they're being written from the present - that is from the author's time period, and not the character's. This one doesn't. And when you read the first two sections, that means that you are reading from, essentially, the middle ages and the renaissance. But, it's not like a historical novel either - for the same reason, it feels like it's written from the present, and the present is the time the book is set in. So, when I say that the book is written in this odd sort of shadow of medieval story - it's not written the WAY those old stories were written. It's not exactly Morte D'Arthur. It's more like the way people really felt, instead of the way they expressed their feelings on the page. The echos of medieval narrative just add power to the story by reminding the reader of the way the events will be remembered, as opposed to the way they actually happened. so Jason, i take it you've read this book. on a scale of one-to-ten, how would you rate it? I'm not good at the 1 to 10 thing. I will say... well... if I had somehow managed to write Canticle, I would probably consider my life's work to be finding a sequel, and if I had to write a sequel to Canticle for Leibowitz, I'd probably end up like Mr. Miller.